Phil Adams & Mindia Robin have taken their passion for dance and created a growing community of wonderful people who all share a love of dance. They teach and judge dance all over, but are based in Southern California. They enjoy inspiring others to improve their dance abilities in a fun environment. 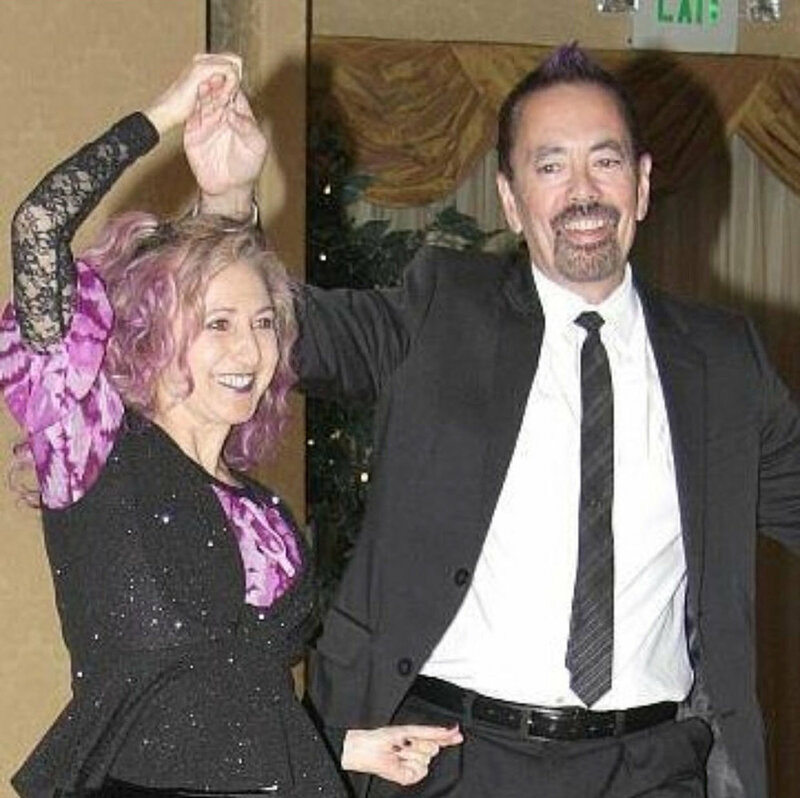 Experience this magical couple first-hand, through their DVD's, weekly classes, private lessons, 1st Saturday Workshop & Swing Dance, Special Events, & entertaining Newsletter "As the Dancer Turns!" Phil and Mindia dancing West Coast Swing with the fun crowd on 1st Saturday, October 6th, 2018 at South Bay Dance Center, Lomita, CA. Song: Brick House by The Commodores. Video recorded by Steve Stingley. Here is an Improv Exhibition of West Coast Swing... Performed by Phil & Mindia at the Spring Ball, Hosted by South Bay Dance Club on May 18th, 2018. (Ayres Hotel in Manhattan Beach)! Thanks to Marie Chura & Linda Corvan for the opportunity. Thanks to Mike Lucek for the video. PIC: Our Dance Team performed at the Westchester Elks Lodge on June 7th, 2018. UPCOMING PERFORMANCES for 2 re-vamped WCS routines in May & June, 2019. Venues & dates TBA. To catch a glimpse of Phil & Mindia doing a lead & follow (improvised) West Coast Swing Dance at the Hacienda Hotel, check out this fun video! They were asked to dance this WCS exhibition at a Latin event. This was in 2014 at the Hacienda Hotel, where Phil & Mindia taught for years. Thanks to Terry Cricksman for taking & sharing the video! Phil & Mindia have a FACEBOOK PAGE: Phil And Mindia Dance! Please visit & like the page. Check out the new Performance Page. Click on ABOUT (located above); the drop down menu will give you options! See fun performances from Phil & Mindia's Dance Team & past Flashmobs, etc. SATURDAY, SEPTEMBER 2nd, 2017: INTERNATIONAL Flashmob performance around the world! Los Angeles venue... DRUM ROLL PLEASE... International West Coast Swing Flashmob Performance (here's the video) & SOCIAL WCS DANCE PARTY!! Phil & Mindia hosted & DJ'd this event. Thanks to Steve Stingley & assistant Marty Heger for videotaping. Flashmob was also performed at Phil & Mindia's 1st Saturday monthly event at South Bay Dance Center, & at their weekly Thursday dance at Westchester Elks! "LOVE FOREVER" MUSIC VIDEO RELEASED! A while back, a sweet couple (former students), David & Brittany Farkas, came to Phil & Mindia's Thursday venue at Westchester Elks (Playa Del Rey), to film a music video for a song from their new album! Phil & Mindia were so thrilled to be a part of this music video project with their inspired dance family! David & Brittany are a lovely couple; they are talented musicians as well. Thank you so much for this opportunity. Please enjoy the music video... watch until the very end for a fun-loving surprise! It was a treat to get to dance to the beautiful song "Love Forever" & share all the joy with everyone. Learn how to dance, with lots of fun along the way! Phil & Mindia (pictured above) offer many classes throughout the week, from Beginner to Advanced levels. They teach at different venues throughout SoCal. Come meet their growing community, and check out their 1st TIMERS FREE offers! No partner needed for any classes. No experience needed for Beginner classes. Drop-ins always welcome for all classes at all locations. Click here for a printable schedule (opens in a new window). NOTE: Click on "ABOUT" at the top to see drop down links for new pages! ***NOTE*** WEDNESDAY, APRIL 17th: CANCELLED CLASSES at Memories in Whittier. THE NEXT MONTHLY WORKSHOP & SWING DANCE EVENT: 1st SATURDAY, MAY 4th, 2019! PHIL & MINDIA TEACH & DJ! SAME VENUE: SOUTH BAY DANCE CENTER in Lomita... 4,500 square foot hardwood dance floor! AGES 18 & up. Complimentary bottled water & snacks included. Join 150 to 200 dancers for one of Southern California's largest Swing Dance parties! On the 1st Saturday of every month (occasionally on the 2nd Saturday), hundreds of dancers come for workshops & social dancing. There are INTERMEDIATE WORKSHOPS for WEST COAST SWING, COUNTRY 2-STEP, & NIGHTCLUB 2-STEP (must know basics; no partner needed). Dance past midnight to great music. PRIVATE LESSONS may be available from 4 to 7pm. *NOTE* See 1st Saturday Event page for pricing , details, & upcoming event dates. Upcoming 1st Saturday Events: JUNE 1st & JULY 6th (PHIL’S BDAY PARTY), 2019! See the printable flyer for details (opens in a new window). WEEKLY VENUE for PHIL & MINDIA'S WEST COAST SWING THURSDAYS at WESTCHESTER ELKS LODGE in PLAYA DEL REY! NO PARTNER OR EXPERIENCE NEEDED for Beginner classes; drop-ins welcome for all classes! PHIL & MINDIA NOW TEACH ALL THREE LEVELS OF WEST COAST SWING CLASSES; ALSO ONLY ONE CLASS TAUGHT AT A TIME. NO DISTRACTIONS! (See Class Schedule page for info. )AGES 21 & up. NO OUTSIDE BEVERAGES PERMITTED. See Class Schedule for details or click here for the printable flyer (opens in a new window). CANCELLED CLASSES & DANCES: Thursdays: April 11th, 18th, & 25th at WC Elks. Wednesday, April 17th at Memories. Come celebrate your Birthday... FREE dancing for you & a friend on the one night of your Birthday! Contact Phil & Mindia in advance to RSVP.